Volkswagen celebrates the one millionth Scirocco by producing an ultra-exclusive special edition model that will only be offered in two countries. Why is the new Scirocco so exclusive? Volkswagen has hit an incredible milestone by building the one million Scirocco model in Wolfsburg Germany. And they will celebrate with an ultra-exclusive special edition Scirocco that will only be offered in two countries, Germany and China. So the rest of us around the globe will only get to look and not touch. So why would Volkswagen only offer this special edition Scirocco sports car in only two countries? At least in the U.S. market, the last Scirocco coupe was sold here in 1988. Volkswagen pulled it from the U.S. market because of the recession and then it was only produced in Europe until 1992 when it was replaced by the Volkswagen Corrado. When it was reintroduced in 2008, Volkswagen was having success with the GTI and was afraid the new Scirocco would take sales away from the performance compact. They felt there was too much risk to bring the sports car back to the U.S.
Will we see the Scirocco back in the U.S.? Last year at the New York Auto Show, Jonathan Browning, CEO of VW Group of America, said that he is lobbying to bring the Scirocco here. "That's a piece of the lineup that I would dearly love to see here," Browning said. While we don’t know if VW will bring the Scirocco back to U.S. shores, it seems that if VW has visions on being the number one automaker in the world, it would make sense to stretch the Scirocco’s legs and bring it here. And the new exclusive special edition model like the GTI hot hatch would likely be a hit. Performance enthusiasts would love to get their hands on this new special edition Scirocco. The ultra-exclusive “Scirocco Million”, gets a number of treatments to set it apart. It will be painted exclusively in “Deep Black Metallic” and will have a recognizable sporty accent strip down the center of the body. It will also sport standard 18-inch alloy wheels with 235/40 tires with 19-inch alloy wheels of the “Lugano” type that are painted silver that are optional. It also comes with R-Line bumpers, R-Line side sills, smoked tail lights, and “Million” stickers on the wings and rear windows that are 90% smoked. The inside of the special edition Scirocco also gets special treatments like “Vienna” black leather seats with contrasting “Snap Orange” seams, stainless steel pedals, entry plates with “Million” lettering and accent strips made of brushed aluminum. The new model also comes with an RCD 310 audio system to provide sound and up-to-date information. The Scirocco Million can be ordered with three different gasoline engines and two diesel engines. The TSI have output ratings of 90 kW / 122 PS, 118 kW / 160 PS and 155 kW / 210 PS; the TDIs develop 103 kW / 140 PS and 130 kW / 177 PS. With the exception of the 122 PS TSI, all engines can be combined with a dual clutch gearbox (DSG). Like the Golf GTI, the Scirocco is a sporty icon. But this special model is only offered exclusively in Germany and China. 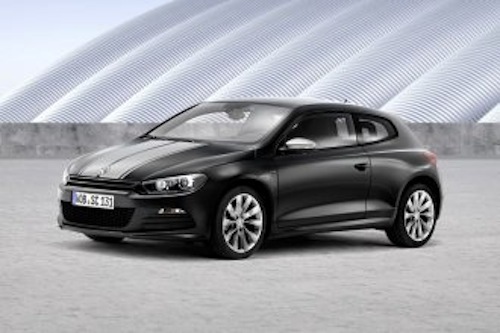 The base price of the Scirocco Million will be 27,325 euros in Germany. The production of the special series will be started as early as the end of May. The rest of us around the globe can only look and not touch.